Mark Bullard, originally from California, says that Bainbridge Island represents everything he loves about the Northwest: the water, the mountains, the lush greenery and the engaged community. In addition to enjoying the island lifestyle which includes caring for eight chickens, a couple of lambs, and a cat, Bullard is also an accomplished writer. His book Pillows for Your Prison (2014) is a fable about a distant land where a king built a windowless prison with walls that reach to the sky. In that land a boy named Amir commits a crime and is sentenced to the infamous prison from which there is no escape. Once inside, he discovers the truth about why no one ever gets out. Bullard's book has been well received by readers. 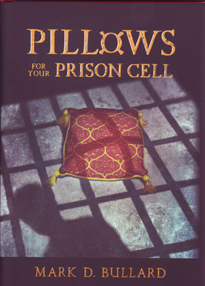 Says one: "Pillows For Your Prison Cell is a powerful allegory rich with longing and illumination. This fast paced story engages the senses as it examines the source of our desires and the trap they lure us into. Recognizing this truth is only the beginning of our healing journey. Finding a strength greater than the desires that imprison us is the essential process this book uncovers. PFYPC is a wonderful teaching tool for families and individuals alike." For more information on Mark Bullard and his book go to http://markdbullard.com/ or http://pfypc.com/.